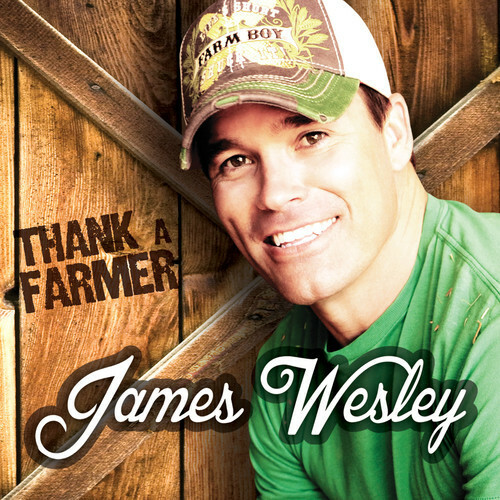 In this exclusive feature story, Broken Bow Recording artist James Wesley discusses his new single "Thank A Farmer," his career thus far (a career which includes the Top 25 hits "Didn't I" and "Real") and his forthcoming album among a string of other topics. For fans who might just be finding out who you are, would you like to talk about your background and where you come from? I grew up in a little bitty small town in southeast Kansas called Mountain Valley – two hundred people in the whole town, and it’s just a small quiet little farm town. A lot of farmers, a lot of hard working people, your typical Midwest small town. A lot of great people from there. Wouldn’t trade anything for it. I learned a lot growing up in that little bitty small town. I grew up in a house that my graddad built. He was the blacksmith of the town, so all the old Fords and all the old tools and everything that he used was still in the old shop when I was a kid growing up. I grew up in that little bitty down, and I always had that dream of pursuing the country music dream. I started singing I guess when I was pretty young. I started singing with a band around eighteen, nineteen years old, just right out of high school. Did that for about a year, and then I kind of started doing my own stuff on the side, singing and playing by myself in some of the local clubs and little venues around there. My first job that I had was in Independence, Kansas, and I talked to the gentlemen. His name was Ed. It was an old Best Western. It was a lounge, and nobody had performed there for quite a while, and I talked Ed into letting me play there Saturday. He paid me fifty bucks, and my equipment cost me forty-five bucks. But man, I wouldn’t trade it for anything. I had a good time growing up. When you have to endure a lot of hardships and hard times, it makes you appreciate even the small things when it comes, and you appreciate the big things even more when it comes around. But that’s just me, man. Would you like to tell us about your single “Thank a Farmer,” and the impact you’d like it to have on listeners? Benny Brown, the owner of Broken Bow, he called me up. It was Tuesday afternoon at five o’clock, and he said “James, can you be at the studio and be there at six?” and I said “I can. I can be there.” I was actually working in my rig putting some new sofas in our rig that we take out on the road. Of course I said, “It’s gonna take me a minute. I gotta pick up some tools and stuff, but I’ll get there.” So I showed up at the studio, and he goes “You ready to cut this, ‘Thank a Farmer’?” I’d only had it for forty-five minutes. They just sent it to me on my way over to the studio. So we get there, and we cut the track for it, and he surprised me with a couple other songs that I had heard that I really loved, but they were on hold for another artist. Anyway, they came up, so he surprised me with that. We tracked three songs that Tuesday, and then I came back Wednesday afternoon, and we laid the vocals down, and I came back in Thursday morning just to listen to the vocals and see if we needed anything else, and they had that song mixed and mastered Thursday afternoon and it was out to some of the stations. So it was fast! Very fast. But the song, it just talks about so much, and we sometimes forget how hard the farmers work and what we wouldn’t have if it wasn’t for them, you know. And it’s just like our troops too. We got so much to be thankful for that we’re living in such a great country. We have farmers, so if we had to, we could provide for ourselves and provide for us and take care of us. So this song covers everything from what they do, from clothing us to feeding us, and it’s just a salute to them to thank them for everything that they do. Which artists would you say have influenced your sound and style the most? When I was just a kid, one of my first influences was Elvis. That was one of the first ones that I was introduced to. I just loved the voice, and it was actually the first music that my mom got me for Christmas one year. He has a very distinctive voice. You can’t mistake him for anybody else. Do you have any upcoming projects or appearances that you’d like to give a little teaser for? Well, right now of course we’re working this new song getting ready to release it to radio. Some at radio I think have already gotten it, but we’ll be out there promoting the song. I’d love to do something somehow with the FFA because I was in the FFA all four years through high school. I’d love to do something with them or just something to do with the farming community. And this song is definitely one of those songs that, whether you’re a farmer or not, you still can listen to this song and you can put yourself on a farm or kind of see what’s going on as you listen to the song itself. One of the things that I’ve got that’s coming up is Hope for the Warriors. It’s a nonprofit organization that when a solider comes home, it’s an organization that helps them out. I’m happy to be a part of that. This is my second year to be invited to sing at the gala that they’re having in Washington, D.C. It’s awesome when these soldiers, these men and women come home from defending our country, defending us and giving us the right to be able to walk out our front door and to choose to do whatever we want to do. Without them, we wouldn’t get to do what we do every day if we didn’t have them taking care and defending our country. I guess it’s just a little something. It’s not a very big thing that I’m doing, but I love being there and hearing the stories, and it’s just amazing to me, what they’ve gone through, and yet their hope and their determination is untouched. It’s amazing. It’s amazing how strong they are. So I’m happy to be a part of that, that organization. What does country music mean to James Wesley? Country music – it’s life. Country music is life to me. That’s where I grew up. That’s where my roots are. That’s where my roots are gonna be. So I would have to say that country is life. And also I was gonna tell you too that I’ve got this deal with this Farm Boy brand, and it’s been pretty awesome that Benny found this song and brought it to me and we got this recorded. I think it’s time that we get back and thank a farmer, so when you see a farmer out there on the road driving a tractor, wave at him and tell him thanks! Read the story behind the creation of "Thank A Farmer" from songwriter/artist Josh Thompson, who co-wrote the song with Dustin Lynch.